Did you know that Fred Armisen was a pro drummer before he started comedy and did TV shows like SNL and Portlandia? If you didn’t we’ll assume you’ve never actually seen Armisen in anything and probably don’t even know his name—music has been a big part of his comedy from the very beginning. He’s like that friend who always slips the fact that he played in bands into casual conversation, but, like, he’s actually funny. And he should be proud of his drumming past: his music career, from the very US ‘80s-’90s mathy postpunk band Trenchmouth, through his stints with the Blue Man Group and as the bandleader on Late Night with Seth Meyers, is legitimately impressive. The “pro” part of “pro drummer” is not an exaggeration: he makes money at music, and everything. Comedy, of course, has been his main gig for almost twenty years, and so, just like almost every other comedian these days, Armisen’s preparing to release a new Netflix stand-up special. 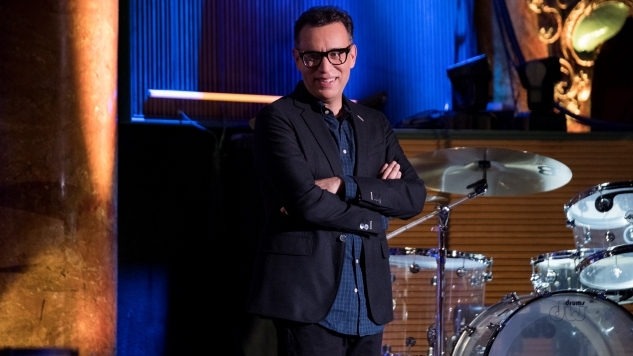 He headlines his musical roots in the special’s name, Fred Armisen: Standup for Drummers, and promises to expound on his love of the percussive arts during the hour-long set. If we’re lucky we might even get some limb independence jokes. Standup for Drummers will be available on Netflix on Feb. 6, 2018, but you can get a tiny glimpse of it below. This is the first trailer for the special, and for a brief spell Paste is the only place you can see it. Check out that trailer right now, pick up some issues of Modern Drummer magazine, listen to some Moon and Bonham and Baker and Kid Millions, tune into the current (final) season of Portlandia on IFC, and then log back into Netflix on Feb. 6 for the full special, whether you’re a drummer or not.